David Ray Griffin is an international treasure and truth teller, who, while being ignored by the mainstream corporate media (MSM) for his extraordinary series of books exposing the false flag attacks of September 11, 2001, will someday be lauded as a modern prophet. To those who know and have studied his work, he is an inspiration for his persistent insistence in a dozen books since 2004 that the truth about the US treachery of that infamous day is essential for understanding the violence, planned by neo-conservatives and embraced by neo-liberals, that the United States has subsequently inflicted on the world. He has consistently argued that to believe in the government’s explanation for 9/11, one has to reject logic, scholarship, and the basic laws of modern science. 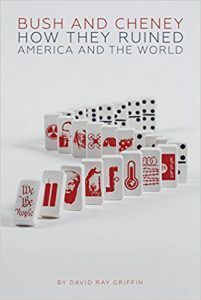 To this end, the first three-quarters of the book is devoted to the “destructive transformations of America and the world as a whole” that were initiated and justified by 9/11, many of which have been accepted by innumerable people as being based on government lies, most notably the war against Iraq. Griffin’s hope is that if he can convince skeptical readers that the government would lie about Iraq, Libya, Ukraine, Syria, Yemen, etc., resulting in the deaths and maiming of millions of innocent people and the destruction of their countries, it would also lie about the attacks of September 11 that “legitimized” such carnage and the ongoing shredding of the US Constitution. However, while granting that the Bush-Cheney administration told big and disastrous lies, which led to millions of deaths, most mainstream commentators have considered the idea that this administration engineered the 9/11 attack to to be so absurd that they can render judgment without checking the evidence. Griffin is a master logician, so he begins with the obvious fact that the Bush-Cheney administration failed to prevent 9/11 and therefore failed to keep America safe that day, as Donald Trump said in a 2016 election debate, for which he was castigated by his opponents and the media. But he was right; it is a fact, whatever Bush-Cheney’s deceptive excuses. As a result of those attacks, the US attacked Afghanistan, claiming that was because Osama bin Laden orchestrated the attacks from that country. No evidence of bin Laden’s guilt was ever presented, though Colin Powell initially said it would be shortly forthcoming (he quickly reneged on the promise). The invasion of Afghanistan, planned well in advance of 9/11, was the start of the war on terror that’s been going on for 16 years with no end in sight. A 16-year-old war based on no evidence, just lies. That Saddam Hussein was connected to 9/11, was developing nuclear weapons, and had weapons of mass destruction. That the attacks on Muslim countries were not based on Islamophobia. And then – the coup de grace – he shows how the official account of 9/11 depends on “miracle stories.” Yet, “a look at the evidence shows that many people who accept science on tobacco, evolution, and global warming, accept miracles, implicitly, on the subject of 9/11, especially in relationship to the World Trade Center (WTC).” Herein lies the great stumbling block to convincing people of the truth of 9/11. Science, logic, careful reasoning, evidence, documentation, what you can observe with your own eyes, etc. – none of this matters when you are intent on being deceived (or pretending to be) because of the implications of examining the evidence and reaching conclusions that are deeply disturbing to your world view, ideology, or sense of self. To admit that you have believed a pack of lies for years is very difficult to accept. But regular people of good will can do so. These are the people Griffin is trying to reach. To convince those who have for years publicly and professionally dismissed those who have questioned the official version of 9/11 as conspiracy nuts is probably an impossible task. To convince the MSM that have worked hand-in-glove with the government to conceal the truth is preposterous. To convince those fine people who are devoted to truth in other areas to reconsider their positions on this core issue is conceivable. Surely the world is full of weird events that logic and science cannot explain. But when the defining event of recent history that has resulted in the world teetering on the edge of final destruction is explained by at least the following 15 miracles that Griffin lists, only a delusional person or one whose will to untruth is set in stone would not be moved to ask how these could be possible, and draw the obvious conclusions. I am reminded of that other foundational case in modern American history: the CIA-directed assassination of JFK. Dan Rather, the famous CBS news anchor, was in Dallas that day, and after seeing the Zapruder film (which was then kept from the American public for a decade), went on television to say that when the president was shot in the head he violently lurched forward, clearly implying that the shot came from Oswald from the rear. Of course, once the public was able to see the film, it was obvious to anyone with eyes that he was violently thrown back and to his left, therefore having been shot from his front right, not by Oswald. Bingo: a conspiracy. Then in 2012, another famous TV personality, Bill O’Reilly wrote a book called Killing Kennedy in which he claims that he and his co-author watched the Zapruder film “time after time to understand the sequence of events,” but still concluded that The Warren Commission was correct and that Oswald shot Kennedy from behind despite the obvious visual evidence to the contrary. Miracles then, miracles now – they seem to define the two key events of modern American history for those wanting to obfuscate the truth. Although the collapses of the WTC buildings were not aided by explosives, the collapses imitated the kinds of implosions that can be induced only by demolition companies. In the case of WTC 7, the structure came down symmetrically (straight down, with an almost perfectly horizontal roofline), which meant that all 82 of the steel support columns had to fall simultaneously, although the building’s fires had a very asymmetrical. So if you care about truth, your country, and the world; if you hate to be lied to; if you care about the victims of American violence everywhere – you should read Bush And Cheney: How They Ruined America And The World. It is a brave and brilliant book. Look at the evidence. Show others. Pass the book on. Give it as a gift. This article was posted on Tuesday, August 29th, 2017 at 6:54pm and is filed under 9-11, Afghanistan, Book Review, CIA, Disinformation, George W. Bush, Iraq, Libya, Militarism, Narrative, NATO, Propaganda, Russia, Ukraine, United States, US Hypocrisy.